This 4-page student handout reinforces the critical concepts of determining density, making accurate observations and calculations, and the proper use of basic pieces of lab equipment. 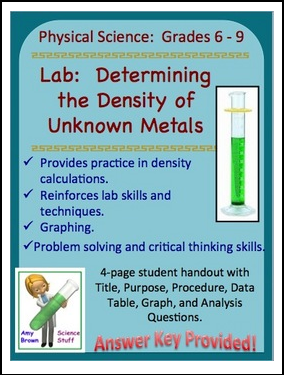 In this lab, the student will be given 4 pieces of unknown metals. The student will determine both the mass and the volume of the metal sample. From these measurements the density will be calculated. The student will compare their calculated density to a table displaying the density of several metals in order to determine the identity of the unknown metal. Students will calculate their percent error and complete a graphing activity involving density. Lab handouts will include Title, Introduction, Purpose, Procedure, Data Tables, Analysis Questions and Graphing Activity.